Architectos premium WordPress theme is an incredible template that provides your visitors with a big impact from their very first moments on your site. Architectos theme’s homepage features a beautiful, modern image slider that takes up the entirety of the browser window, while allowing for a clean, simple navigation to take the backseat to your work. Architectos works great as a portfolio or online gallery theme that truly makes the most out of all the space in front of your visitors. Check out the demo at the end of the post! 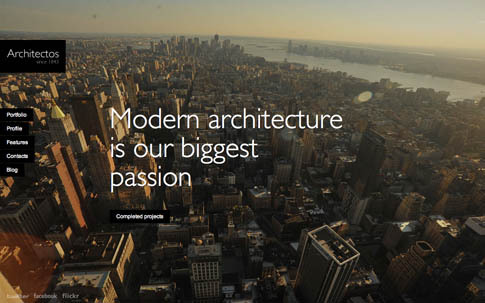 Come back and check out the showcase as we find more sites from around the web using Architectos.